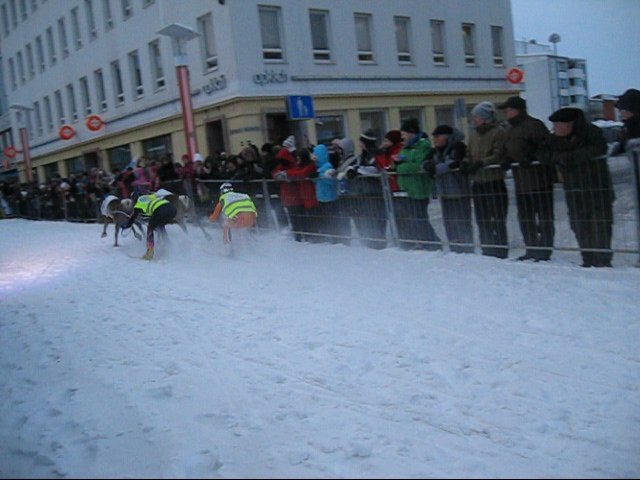 In mid-March, I made it to the Rovaniemi Reindeer Sprint Race. 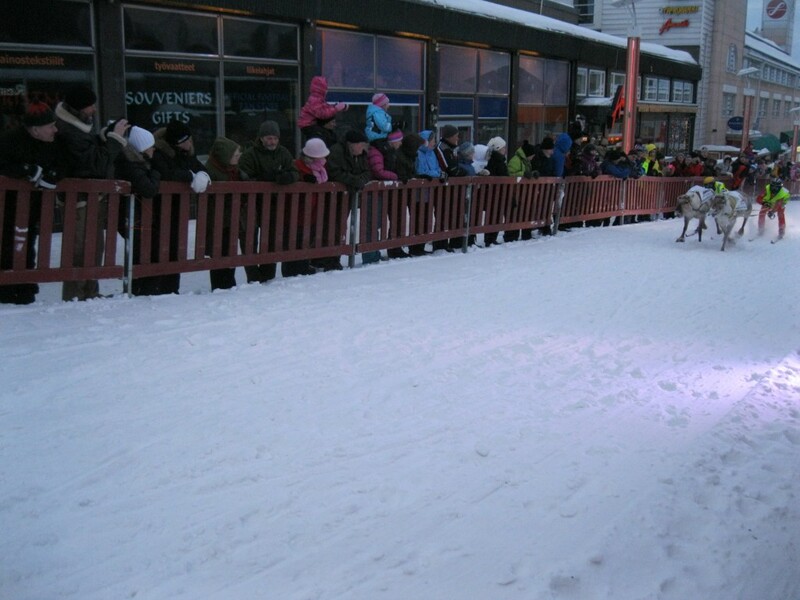 This is an annual event, wherein the city of Rovaniemi trucks in a bunch of snow and paves a 200-meter raceway through the middle of downtown Rovaniemi so that reindeer-drawn skiers can race. Yes, this is as cool as it sounds. 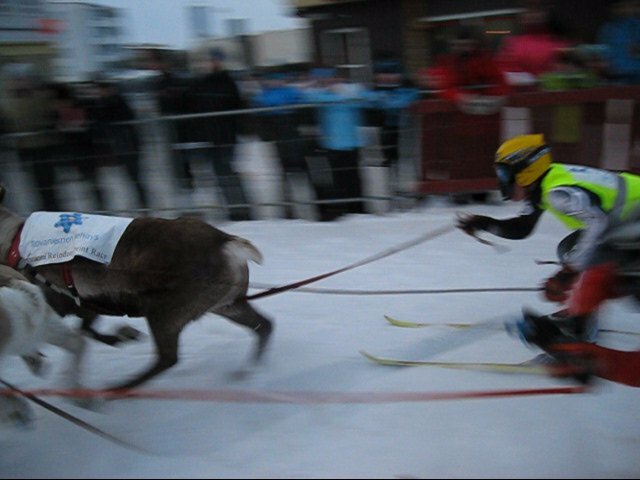 The logistics are also a little awe-inspiring, as the reindeer seem to only run when physically touching (this is perhaps the logic behind only having 2 reindeer race at a time). The reins are accordingly placed with the first rein running between the reindeer’s legs, making for a rope wedgie (that may or may not actually be the reason they’re running), and the second rein on the outside of the reindeer mash-up, so the rope has free range of motion to be whipped across the flanks of the beasts. Muwahahaaha! So the racers (drivers? jockeys? skiers?) 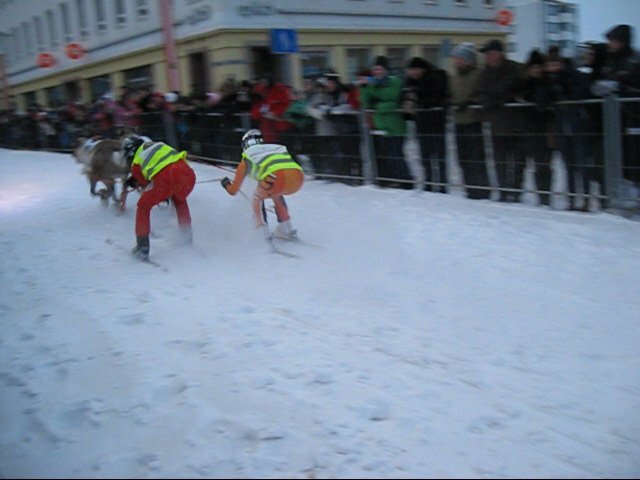 not only have to keep the naturally lazy reindeer at a dead run, which is something they clearly don’t enjoy, but they also have to deal with the fact that they’re plastered up against their similarly ski-clad human competition. There were some definite wobbles. Standing in one spot along the course, you only have a few seconds to follow the heaving, running mass as it comes into and then out of your line of sight. They’re surprisingly speedy! The event is a major tourist draw for Rovaniemi, so there was an excellent, extremely enthusiastic emcee, who announced in Finnish, and then English (when he remembered). 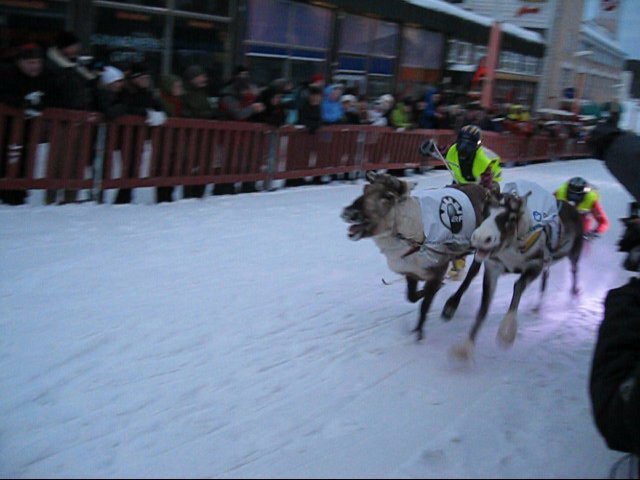 There were a total of 16 reindeer competitors. There was a first round of paired races, and the 8 winners continued on to the second round. The 4 winners of the second round of races were seeded based on their average previous running times (18-21 seconds), and then there was a final pair of races to determine the 1st, 2nd and 3rd place winners. 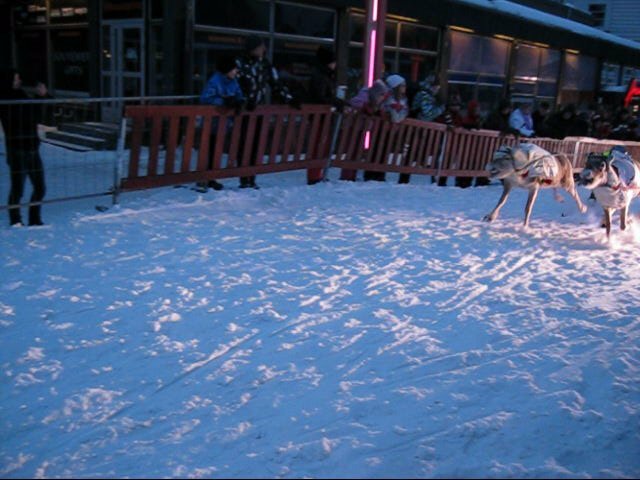 They also did a good job of pairing the reindeer based on size, because there was quite a bit of variety in brawniness of the animals, so that at least the first 2 rounds were as fair as possible, but the last race was a small reindeer pitted against a giant one. At the end of each race, the reindeer were herded into waiting minivans and driven back down to the starting line on the river. Sorry for the blurry picture, but at this point it was cold enough that my camera was refusing to work properly. I was rooting for a reindeer named ‘Visa’, mostly because I liked the idea of a reindeer named like a credit card. He was also the winner last year, so he was a favorite, which I didn’t realize when I took up his banner. In the picture below, you see him whooping on his racing opponent! The evening turned quite cold and windy, but this was a really fun event despite the loss of feeling in my extremities. 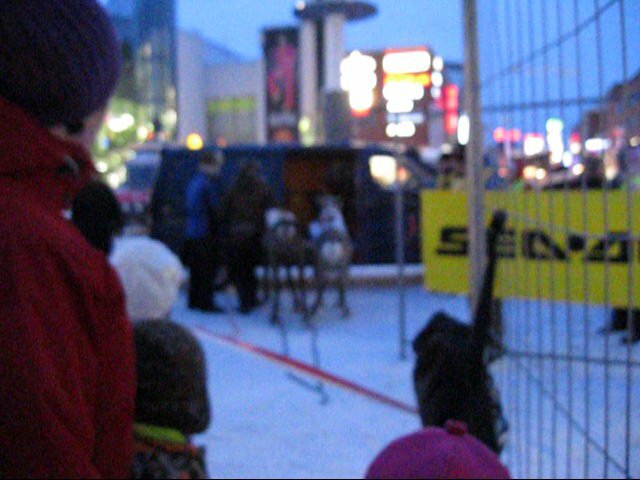 My one big failure of the day was that I couldn’t find the exact location of another event that was taking place downtown that evening – the reindeer meat cooking competition. I’m not even kidding! In a rash moment of pure evil, I convinced an 8-year old American boy that they were serving up last year’s losers…. 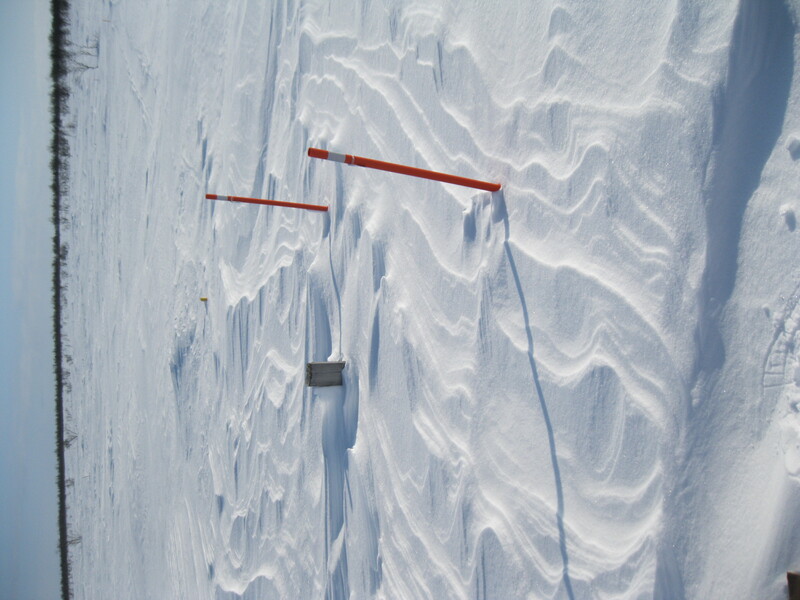 I also had my customary field work trip to Kevo in the middle of the month. 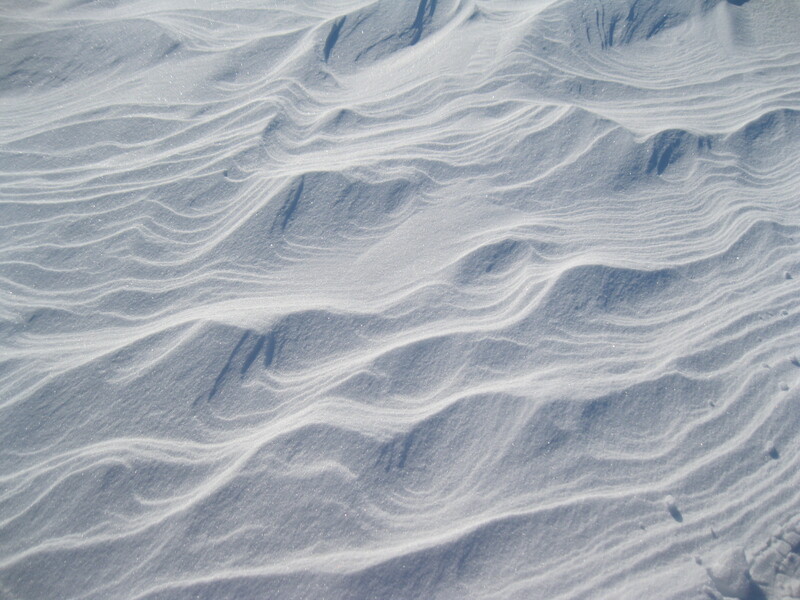 The weather took an unfortunate turn towards the frigid (-30C) on my field day, but the slightly warmer weather the last few weeks has turned the snow cover into a crusty, windswept number that was fun to snowshoe on top of, and to photograph. 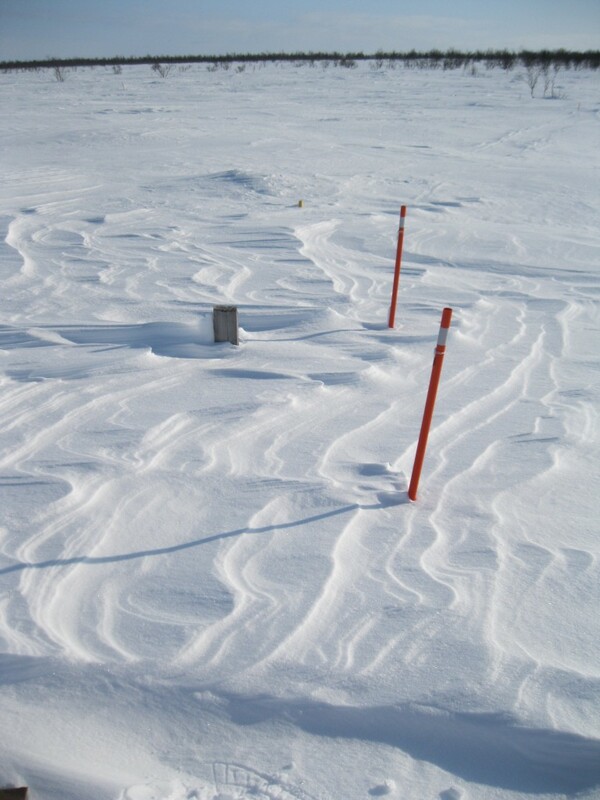 This entry was posted in Kevo, Musings, Rovaniemi by Kim. Bookmark the permalink.